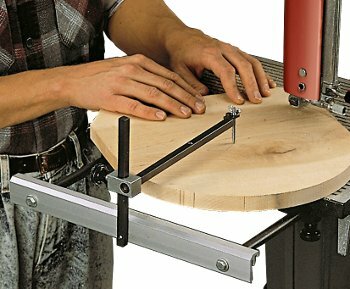 Just attach the circle cutter to your bandsaw table extension (555488) with a single bolt... use the single adjustment knob to set the attachment for your desired diameter and stock thickness... and pivot your workpiece through the bandsaw blade to cut perfect circles from 2" to 36" in diameter. It's just that simple ! The heavy, twin steel bars provide plenty of rigidity while the single adjustment knob makes setting your desired circle size both fast and precise. If necessary, the center pivot pin adjusts up and down, then locks into position with a wing nut. Handles any thickness of stock, all the way up to your bandsaw's maximum 6" depth-of-cut. 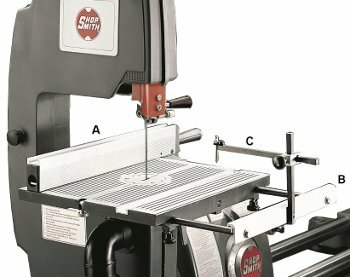 This three-piece accessory package helps you get the most out of your Shopsmith bandsaw. Includes: (A) Bandsaw fence for improved straight-line cutting results • (B) Table Extension to add 11-1/2" of outboard support for improved workpiece control and precision and • (C) Circle cutter to help you create perfectly round circles in a flash.